Product Details - Material - Natural Rubber , Dimension - 6 cm-30 cm, Use - hand loop to make throwing it easy, Suitable - Mini and Small Breed . 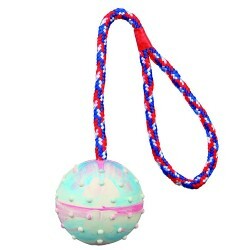 Product Information - The Trixie Ball on a Rope Dog Toy is made from natural rubber and has a hand loop to make throwing it easy. It comes in several sizes.